June 8, 2:40 PDT - Well, it's been a long, but exciting, couple of days. More pictures to come, short on time. After leaving the bike store just before rush hour, we ran into a fan snags. Within 15 minutes of leaving Astoria, we already needed the first aid kit twice. Shortly thereafter, Wills' pedal fell off of his bike twice, in the middle of a construction area, and we got lost right after that. It was a tough first half hour and we both began questioning just what in the hell we were doing. We made it into camp the first night after watching a gorgeous sunset over the Pacific, we rolled into camp around 8-ish. Our first meal was nothing short of a miracle. Our alcohol stove (made out of an old Budweiser can) proved quite dangerous. Caroline nearly set an entire can of denatured alcohol on fire in the process, but fortunatley we were able to feast on a meal of burned beans, cold corn, and half-cooked Ramen. As disgusting as it may sound, not one bite of food remained. We awoke around 7am to find the rest of the tourists long gone. We packed every thing up and headed out on the road, hoping to enjoy a trouble free ride to Cape Lookout. 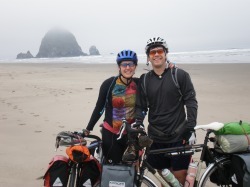 We rode through Cannon Beach, right on the Pacific Coast, and dipped our back tires in the ocean. Unfortunately for us, the route lead us through a tunnel with a very narrow shoulder. As we were riding through, a giant logging truck rode by , when no other cars were around, and nearly hit us. We both fell over onto the small sidewalk and decided right then that we would be walking through every other tunnel. A couple miles later, Wills' pedal problem struck again. This time there was no fixing it, not even with duct tape. Luckily we happened to be at a trailhead and ran into a crew of Texans. One of them, Jean, a biking enthusiast, came to our rescue. Also, the rescue party had 2 cars. The first car, saw us in the tunnel almost get hit by the logging truck and the second car drove through to see u slaying on the side walk. The Junkers offered to pile us and our bikes in their rented minivan and haul us thirty some odd miles to the nearest bike shop in TIllamook. (One member of the recue party had on a St. Christopher pendant as well.) At the bike shop, WIlls got a new crank set (thanks Dad!). After that we were on to Cape Lookout State Park. We got there just before it started pouring down rain. Rather than enjoying the view of the Pacific as we had hoped, we ate PB & honey sandwiches and pop tarts in the t ent. We rode from Cape Lookout to Rose Lodge, about 43 miles or so. It was a beautiful ride along the Pacific coast. After riding with two other tourists for some time, we ate lunch in Neskowinn, our last stop along the coast and then headed inland. We camped at a pretty RV park along the Salmon River. Probably the most enjoyable and funnier days of the trip. We started the day only planning on doing for 40 some odd miles. We picked up some fresh cherries on the side of the highway for lunch. We rode through Fort Hill and stopped at an intersection to ask for directions. Looking up from the map, a tall man with a shotgun was headed our way. As it turns out, Pete was gopher hunting in his front yard. He ended up giving us some beef jerky sticks from a local packing plant and 30 minutes of directions that we had no intention of using. We also stopped at Bianca winery along the route and did a wine tasting. We rode to RIckreall, but then decided to ride another 27 miles to Corvallis. In Corvallis, we met an original member of the 1976 Trans American bike ride. We also met Ciel, who offered us her home and hot tub to stay for the night but it was 7 miles uphill of back tracking. So we declined and headed to the camp site. We got to camp at 8 , where a German touring bus of 15 Germans gave us a free dinner of pasta and meat sauce. Just over 72 miles, ouch. Today hurt. We rode only 43 miles to Eugene, to get our bikes serviced. We stayed at the Downtown Inn (thanks Mom) and ordered 3 Domino's Pizzas and drank a 6 pack of Bud Light while watching NIcholas Cage movies on tv ( Gone in 60 Seconds and the Rock). And it was Awesome. We got our bikes serviced and are heading 6 miles to Coburg for the night. Running out of time at the library, will try to update again soon. Crossing the Cascades over the next week. Pray for us. June 3 - 4:00 PST. Hey everyone, We're in Astoria and unfortunately have not gotten on the road yet. We went to an awesome breakfast place near Paul's house, and then he was kind enough to drive us to Astoria. We arrived at the bike store, however our bikes had not been built yet. So, we're waiting here on them and luckily they have a computer to use! Our plan is to head to Seaside, Oregon tonight. It's about 20 miles from Astoria and on the Pacific Coast. While we've been in Astoria, we've stocked up on Ramen noodles, peanut butter, honey, bread, and pop tarts. I have a feeling that you will hear us mention those food items quite a bit this summer. Looks like Wills' bike is almost ready. We are definitely ready now!!! JUNE 3, 2009: Good morning to everyone swinging by, Wills here. We are in Portland, OR this Morning staying with Paul Gerald, a friend and neighbor from Memphis. I must say that Paul lives in one of THE coolest houses out here. Dubbed the "Tree House", the house is on hill, with the back porch in the state park, overlooking Portland. It is seriously like a grown-up tree house. Complete with bunk beds, a glass ceiling, moon windows, and decks that surround the house. Yesterday we awoke at about 4:30 AM central time to pack and get to the airport for our 7:30 CDT takeoff. We left the house by 6 and our Mom drove us to the airport. The feeling of leaving everything behind for 2 months hadn't quite sunk in until in the car ride. I felt almost naked without my cell phone, keys, car, wallet, credit cards, computer, or any other possessions that I would normally be taking. We were both excited/scared but we were unsure of which one it was. We arrived at the airport and unfortunately had to check 2 bags because we were stupid enough to ask if we could carry one of them onto the plane. It was very uncomfortable sitting in the airport, because I hate flying almost as much as going to the dentist. On a darker note, we got to watch CNN's breaking coverage of the crashed Air France flight the previous night, right before boarding the plane. Fortunately, we arrived safely in Phoenix, had a quick layover, and touched down in Portland around 1pm PDT Paul was there waiting to meet us at the airport. Our first stop was the Columbia River Gorge, a scenic park near Portland with dozens of beautiful waterfalls and lovely vistas. From there, we headed to Edgewood, a multi-bar beer garden complex complete with a micro-brewery and winery. After sample some local ales, in which Caroline and I liked none of the same beers, we headed to Portland. Paul showed us around what is equivalent to Memphis' Cooper Young area and Dallas' Lakewood area - a slew of independently-owned stores - only here, the ENTIRE city is like that. We bummed around visiting different hoods with our fabulous guide, Paul. Paul, is an author and has published several books - one of which we discovered is the #2 non-fiction seller at Powell's, the largest book store on earth. His hiking guide is currently outselling BOTH of Obama's book and is second only to Three Cups of Tea. Next stop was dinner. Paul suggested Lebanese food. When I asked the obvious - "What the hell is Lebanese food" - Paul said it was Falafel and hummus. Now I've been to the Falafel Hut in Knoxville, but I'm not sure that counts. So, we ordered two mezzas, which was meant for 2 people, and between the three of us, could not even come close to finishing the array of meat and assorted pastries that came out with the meal. Full to the gills, we came to the "Tree House" and went on a hike in Paul's backyard. Literally. As Paul is also an author of a book about breakfast joints in Portland, we are going to take advantage of his expertise and get ourselves one last quality meal before we heat up the Alcohol-Beer Can stove and dig into some Ramen noodles.